As part of the award-winning SAP PartnerEdge program, the ‘Build’ engagement model offers solution providers and independent software vendors (ISVs) the ability to rapidly design, build, and commercialize their applications under a single, comprehensive partner program. Whether they are creating standalone commercial software, extending SAP solutions, integrating and connecting to SAP data, or modernizing an existing application, the SAP PartnerEdge ­– Build program will support them at every stage of their journey. What does this journey look like? Over the last few months, we’ve overhauled our key platforms, tools, and applications with the goal of providing a harmonized ISV build journey. Regardless whether you’re a big established organization or a small startup, or an existing SAP customer trying new business models, we aim to offer the same ISV build journey to every company interested in developing applications with SAP technology. In a series of blog posts over the coming weeks I will take you through this journey step by step, from learning about the program through successfully selling your solution via the SAP App Center. We have a wide choice of resources and tools available to support you at every stage, and I will highlight various touchpoints along the way. There are many types of ISVs and solution providers, but we’ve designed a consistent journey for building and selling their applications. In the plan and design stage we support partners in the process of blending their vertical or functional expertise with SAP innovations. Partners can engage with best-of-breed technologies in cloud, mobile, internet of things, machine learning, artificial intelligence and more. In the build and innovate stage, partners can access SAP online courses, SAP Learning Hub, SAP Help Portal and Tutorial Navigator to support their teams’ rapid enablement. Partners also have access to SAP platforms for cloud, in-memory data handling, and advanced analytics to accelerate innovation. In the go-to-market stage, partners benefit from services that focus on accelerating the availability and promotion of their commercial solutions, including application readiness checks, marketing support and enablement. SAP also offers the ability for partners to embed SAP technologies with their intellectual property so that they can self-sufficiently sell a bundled solution to customers while leveraging the SAP App Center as a primary route to market. The lane diagram shows two main lanes: one for SAP PartnerEdge ­– Build and one for Open Ecosystem – Build. The upper lane symbolizes our full partnership program. To follow this route, partners need to pay an annual program fee. They can ride this lane all the way to the go-to-market stage, where they can sell their app to customers. The lower lane is for members of the open ecosystem with the ‘build’ specialization. It’s free to ride, but as you can see in the picture members will need to join the SAP PartnerEdge – Build lane by the end of the build and innovate stage. Go-to-market related services and benefits are not part of the open ecosystem program offering. Only partners enrolled to SAP PartnerEdge – Build can take advantage of go-to-market benefits and sell their application via the SAP App Center or other channels. In the learn and apply stage, prospect partners will find information about the SAP PartnerEdge – Build program offering, and they can apply for partnership. In the get started stage, partners are onboarded to SAP’s partner platforms and tools. They are also able to subscribe to a broad portfolio of test, demonstration, and development licensing services required for their application development. In the stay connected stage, SAP offer several means for partners to engage with SAP experts or peers through different channels. Different lines and circles explain the various touchpoints along the build journey. The blue line shows the road for SAP PartnerEdge – Build partners, while the yellow line is indicating the Open Ecosystem – Build route. Consistent with the lane diagram in the previous picture, you can see the go-to-market stage cannot be visited by Open Ecosystem – Build members. To help explain the journey, I have used different icons and symbols. I have identified different types of touchpoints, such as a website, a document, an app, an email, and so on. Some are publicly accessible, others require an S-user ID and password. At the end of each stage, the partner reaches a milestone which allows them to progress to the next stage. Different colored lines indicate different levels of access. Blue roads are only accessible for full partners, while yellow roads are applicable for Open Ecosystem – Build members. Most of the roads throughout the journey are dual lane: yellow plus blue indicates the road is open for all! Each little icon includes a hyperlink to the touchpoint, so if you download a copy of this deck you can use it to easily jump to the different touchpoints directly. Over the next few weeks, we will publish blog posts for each of the six stages of the ISV build journey. I hope the complete series will give you a good overview of the entire journey. If you have any questions, please post them below. 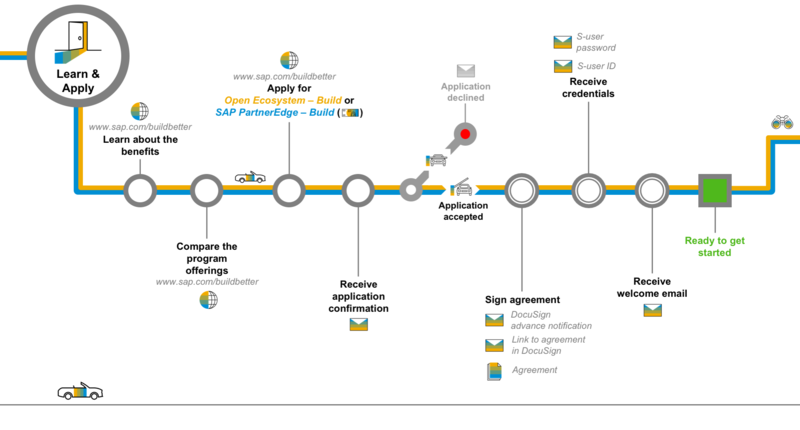 If you want to learn more about SAP PartnerEdge – Build, or apply for partnership, please visit www.sap.com/buildbetter. In the next blog post, I’ll cover the learn and apply stage. In case you’re curious what it will look like, here is a sneak preview. I hope to see you back!